ChristineCreations: Power Poppy & Misti Blog Hop! 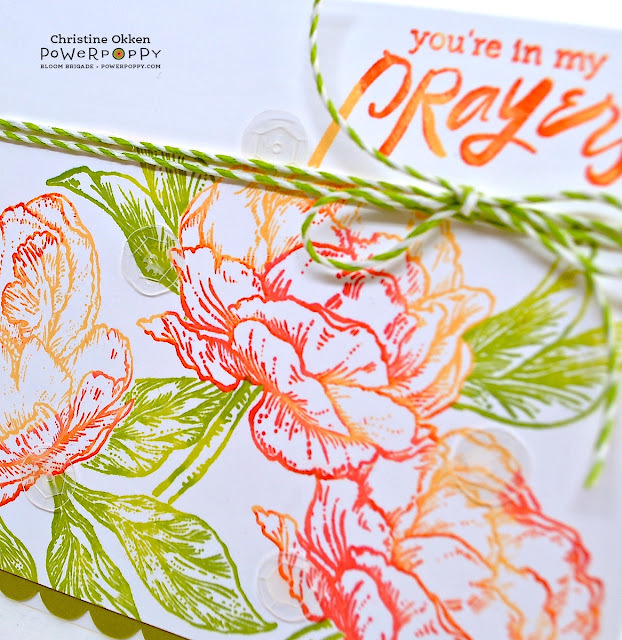 Power Poppy & Misti Blog Hop! Happy Friday everyone! 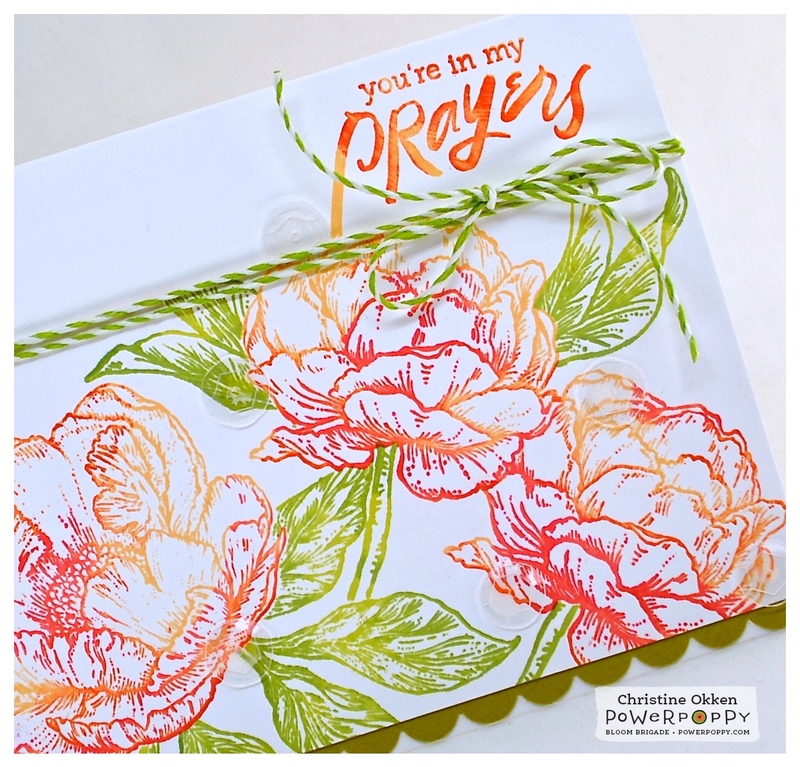 Today Power Poppy is pairing up today with My Sweet Petunia for a fantastic Blog Hop showcasing the amazing Misti stamping tool! I am so delighted to have this nifty tool now because it makes stamping so much easier, so much more professional and polished, PLUS you can do so many cool things with the tool, so it expands your stamping as well. Today I have two cards showing a similar technique, done two ways with different mediums. One of the things I appreciate most about the Misti, is how precisely you can stamp your images. If you don’t press hard enough, you have a really large stamp that needs extra coverage or a solid stamp that needs filling in and it doesn’t work the first time, your Misti comes to the rescue! You can re-stamp the image to perfection. No worries about the image not lining up properly. I’ve found that you can use this to your advantage with techniques as well. First up, I’ve done some stamping using one image in multiple colours. On this clean and simple spring design I used Power Poppy’s gorgeous new set, Peony Muse to make a pretty peony garden. I love the variety of colours peonies come in and with the Misti, you can stamp an image multiple times adding different ink each time. This leaves you with a multi-coloured image, like a multi-coloured peony. 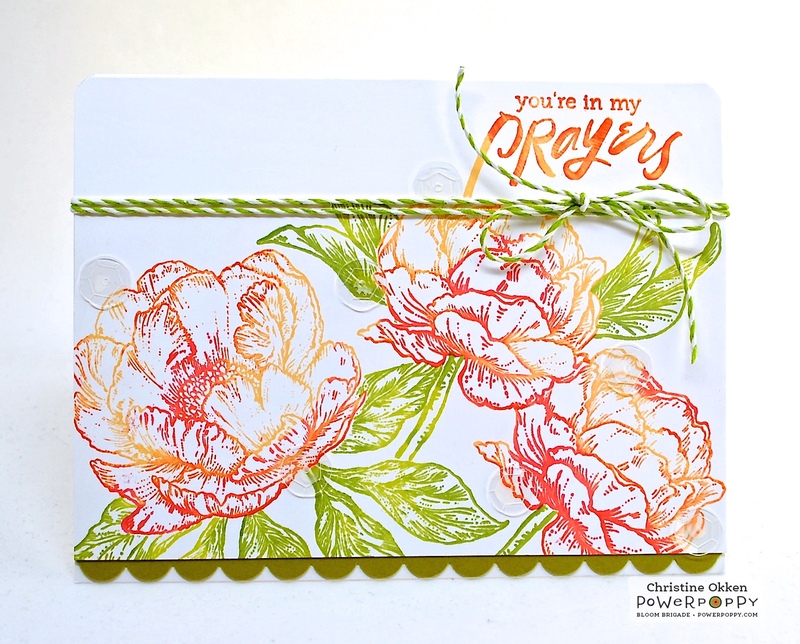 First I stamped the peonies fully inked in Memento Canteloupe. Next, I inked up just part of of the peony stamp in Tangelo ink, stamped it, and then finally, I inked up a little less the of the stamp in Lady Bug ink. All you need to do is swipe your ink pad slightly over some of the areas of the stamp and then press down on the paper. I used the same technique with the leaves using Memento Pear Tart ink and then Bamboo Leaves. I also used the same technique with the lovely sentiment. The design is finished off with some Baker’s Twine and clear sequins. Next, I used the same technique for a watercolor style. 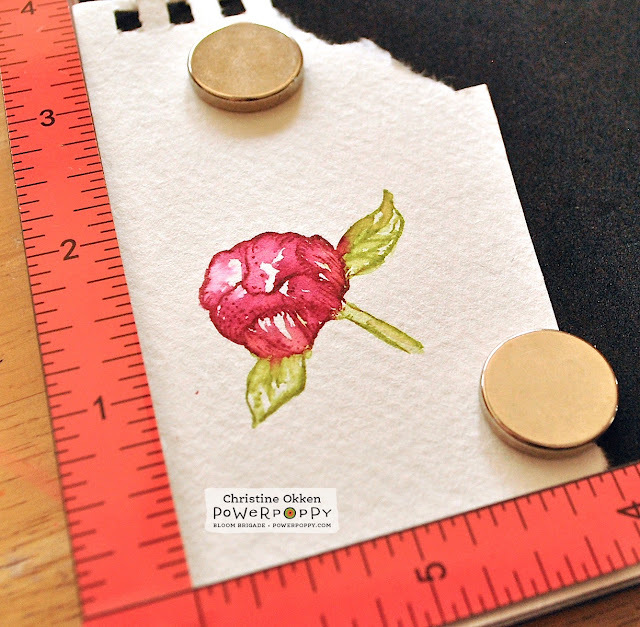 With the same peony stamp I inked the blooms with a waterbased ink (SU - Purely Pomegranate) on watercolor paper. Then, I used my waterbrush to pick up the colour from the stamp and wash it in, colouring the petals. By doing this you lose some of the details of the stamp, which is nice for a soft effect, but if you want to add the details back in, all you need to do is wait for the paper to dry and then restamp the peony with Purely Pomegranate ink again. Here you can see the peonies watercoloured and then restamped with ink for the background layer. I added in the centers of the flowers with a black sharpie to coordinate with the colours I was using for the card. For the accent flower you can see above how I’ve washed in the ink to give the bud some colour and below, I’ve stamped it one more time to add in some of the detail lines. It’s subtle, but a good effect. And here’s a closeup of the card with a layer of vellum, a pretty sentiment from Power Poppy’s set Artful Display, and then some sewing, sparkly ribbon and some enamel dots. Now for some more fun! We have prizes on this fun hop that you’ll want to get in on! 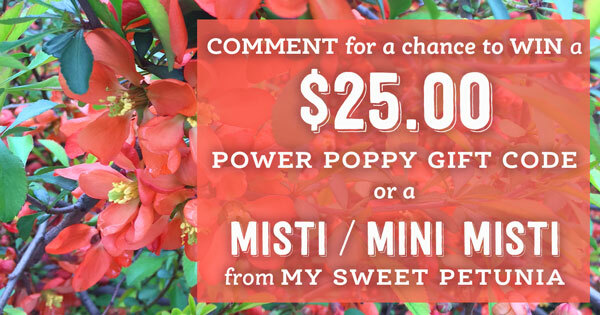 All you need to do is leave a comment on each blog for a chance to win the Power Poppy giveaway (one of 2 $25 gift certificates) and the MISTI giveaway (the winner's choice of original or mini)! MISTI Winners will be announced on this page of the My Sweet Petunia blog on April 14th. 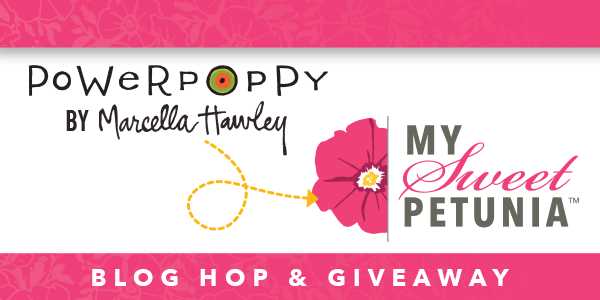 (Please include this link) Power Poppy Winners of (2) $25 gift certificates will be on the Power Poppy Blog on the 14th. Thanks for stopping by! I know you’ll find much more amazing inspiration along the way. Two gorgeous creations! Ahhh, spring flowers, spring colors-love them! It looks like one of the layered stamps. The Misti is amazing. Both cards are SO beautiful, Christine! Your coloring always inspires me! Your colors are so rich. Your stitching on the second card is so perfect and the addition of the vellum is such a lovely touch. Just gorgeous, GF! (((HUGS))). Both cards are inspiring but I love the first one where you used multiple ink pad colors.....would have been impossible to get perfectly without the MISTI. I don't have a MISTI but think I will have to get one after seeing all the great things you can do with it on this FUN blog hop! ;) Thanks for sharing your work. Beautiful cards!! Thank you for sharing you technique!! Gorgeous! I love the vellum overlay & the popped out bud! Love your cards, but the first one is so beautiful. Thank you for sharing. Beautiful work, love you how-to, use of vellum and pretty colors. Love the multi-colored peonies! Thanks for sharing how you did them. Can't wait to give it a try! Such a lovely sample - thank you for being part of the blog. Very beautiful cards, love this stamp set. I like all the colors on the first card! OMG!!! Love your gorgeous cards!!! Your colouring is really breathless!!! Both are beautiful cards. Absolutely love the colors on the first one. Beautiful cards. Thanks for sharing and inspiring. Gorgeous cards! Thanks for sharing your ink colors and how you were able to multi-color the peonies. The watercolor is beautiful! Both of these are so pretty! Really love the multi-color stamping. Beautiful. Beautiful images and you've made them into fabulous cards. the work is beautiful and I would love a misty. Beautiful cards Christine! I need to try these w/my Misti! Thanks for the inspiration! i love this easy watercoloring! stamping again afterwards to restore the detail is brilliant. your color combos are wonderful too! Love your cards Christine. Thanks for sharing these beautiful cards. I would live to have MISTI. What an awesome tool to have! So beautiful! I love the colours and the embossing. Your card ideas are beautiful. I cannot live without my MISTI. But, i sure would like the mini size! Your card was wonderful and so well designed. I appreciate your work and inspiration. Beautiful cards. Loved seeing how you used the Misti. I don't have one yet, so would love to win one. Gorgeous!! I love the multi toned flowers on the first and the idea of using the ink for a color wash on the second! So beautiful! Both cards are beautiful! Love the idea of re-stamping after washing the petals out. Love how you were able to mix the colors! Beautiful! These are both gorgeous Christine and love how you've used the MISTI to use the multiple colours - how cool is that!! Love the mix of colors on the flowers of your first card! Oh my goodness Christine these are beautiful. I love peonies and poppy stamps for on my cards, they are so classy looking. TFS! Your watercolor effect is my favorite! I love that card! Beautiful cards! Love water coloring! Gorgeous cards! 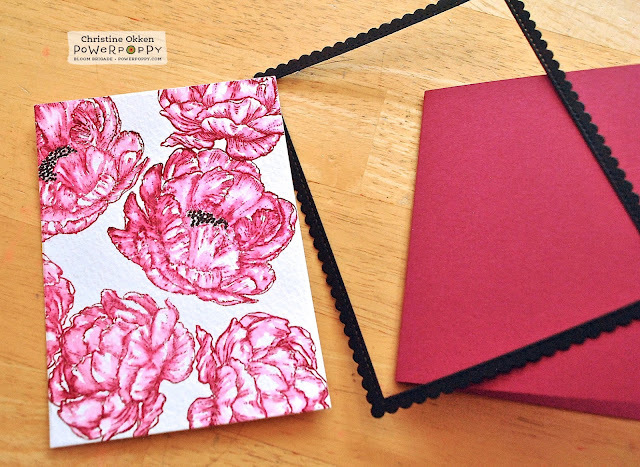 Love the beautiful peony flowers, and great tips on the use of the MISTI! What a lovely soft card! The multi colors made it really special for that sentiment. Again another way to Misti! Beautiful cards! I particularly love the multicoloured one. These cards are gorgeous! Beautiful vibrant colors. I love what you did with the multiple colours stamping, it also looks gorgeous on fall leaves stamps! Love the idea of the multiple colors - can't wait to try this. Thanks for the idea of using the MISTI to restamp after coloring the image. Great card. Thanks for sharing. These are amazing! I love the multi color stamp! Two very gorgeous cards! 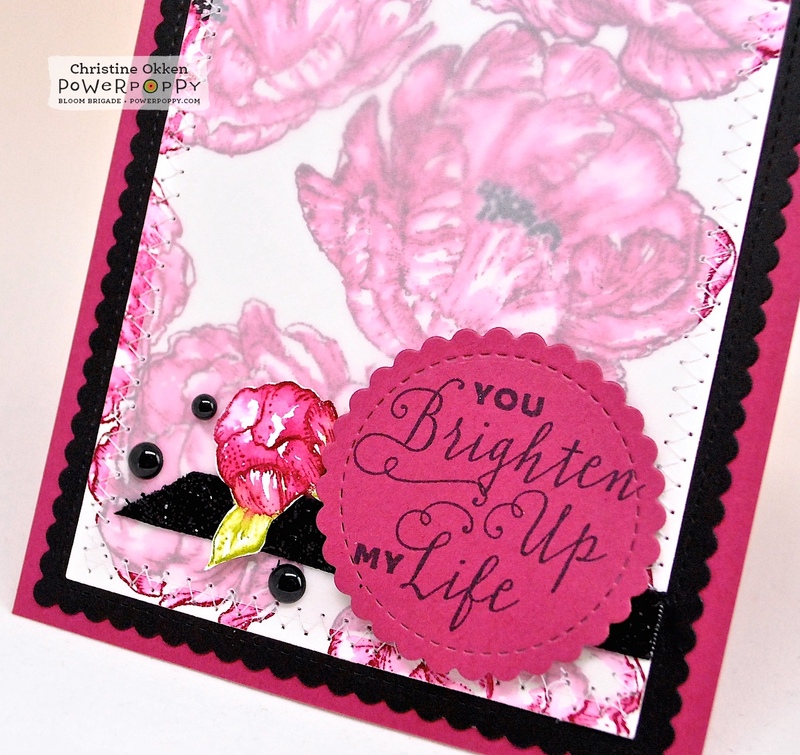 Thanks for showing how you can be versatile with a stamp set. Your cards are beautiful. Thanks for telling us how you did the first one. So glad you shared. Beautiful cards. I love the color choices. We are ready for Spring! Both cards are lovely. I do find Poppy Stamps so pretty. Beautiful cards! Loving your two tone peonies! Gorgeous! Beautiful cards, love how you've shown different ways to use the same stamp. Love the colors on these beauties! Love the shading of your Poppies! These are two very pretty cards with a lovely stamp! Love the colors of the flowers - very spring like! Two beautiful,very different cards from one of the foremost coloring queens I know! I love the way that you re-stamped after coloring. I'll have to try that. I'm not much of a stamper but with the MISTI...maybe. Both cards are lovely. Two very different techniques, but both showcase the stamp beautifully. So pretty! I love how you used your Misti! Beautiful cards! Such a gorgeous stamp to start with!! Two beautiful cards! I'm in love with this stamp! I love how you did the first card, and sympathy cards I feel are the hardest to make. Thank you for sharing! Thanks for your fabulous tips on coloring! Your cards are wonderful! Beautiful cards and I love how you stamped the first card, thats a clever idea. What is possible with a stamping tool!!! I absolutely LOVE peonies and your renditions are gorgeous! Beautiful colors! Thanks so very much for sharing! wow...how pretty...thanks soooo much for sharing with us...would so so so so love to win either prize! Your Peony's are so beautiful! I love Peony's!! Beautiful cards, the velum make a muted softer look. Aaaw... Spring is defiantly in the air. 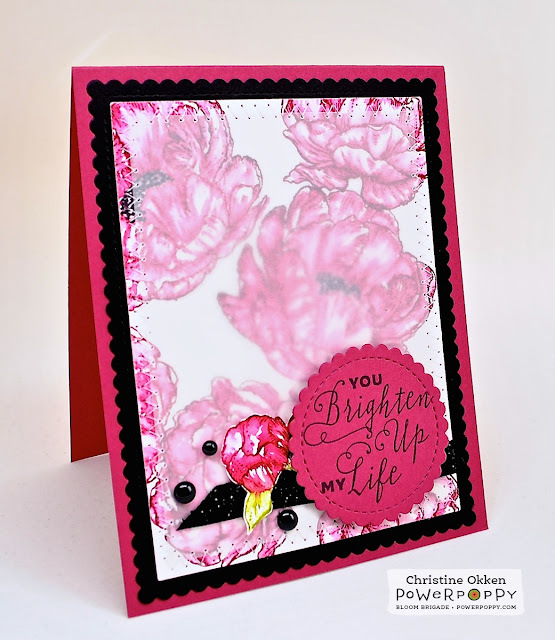 I like the different looks you achieved with this peony stamp and the Misti. Love how you've inked this set up with different colors! Peony muse is one of my favorite sets. Beautiful. Love your colors you used for the flowers! Thank you for sharing! Peonies are such a beautiful flower, you and these stamps really capture their beauty. gosh I'm so excited to "meet" these stamps! beautiful card! Wow,what great techniques.Thank you sooo much for showing us. I am soooo excited about this Misti. Beautiful cards, I love this stamp! Love the effect and Colours. Thanks for sharing! Beautiful cards, I like how you used different colors on the first card, pretty combo!! Such lovely coloring! I've been wanting to try the technique of watercoloring and then re-stamping the original lines on top, thanks for demonstrating it! Such a beautiful card! I love the multi-colored peonies! Love both cards, but especially the "coloring technique" in the first one . .. thanks for the inspiration and technique . . .. makes for a gorgeous flower! I love both of these cards and both techniques. I'm really liking the peony stamp. It makes some really beautiful cards. Pretty cards, I especially like the multi coloured one, thank you for the tips on how to do that. Wow! I love how with the Misti you can watercolor and then perfectly stamp gain for definition. Awesome cards! Ohhh... so excited to get off of here and give that a try with some inks!!! What a simple yet effective way of stamping!!! Such beautiful cards, you made the stamps look like layerin stamps. I love the peonies and the tulips. I love both cards. The vellum over the deep colored flowers is a cool idea. I also love the color toned peonies. Really interesting effect. Love the stamp set you chose and it's amazing what you did with the stamping on the first one. You are so creative who knows what you will think up next. Keep it coming, oh thanks for being in the hop. Your cards are simply lovely and definitely highlight the many advantages of the MISTI. I live being able to out the detail back into an image after watercoloring. Beautiful cards!! Love those variegated outline images & the Pomegranate flowers are gorgeous! Those peonies are fantastic. One of my favorite flowers! What beautiful cards you've created! I'm especially interested in the watercolour technique one. It looks fabulous! Such beautiful cards! 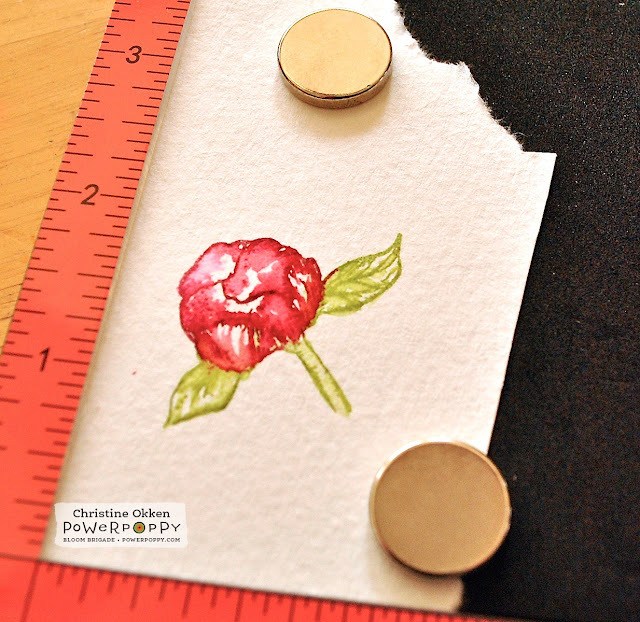 Love the peony stamps! Beautiful cards! Love the peony stamps! Both cards are beautiful. Thanks for sharing. Your card is very pretty. I like the versatility of my stamps when using the Misti! What a fun way to have very colorful peonies with out a lot of coloring! Will definitely be trying that with some of my stamps. Lovely cards! Love the different techiques. The orange peonies are GORGEOUS! I love how you used different colors of ink on your first card. I also love how you stamped over your watercolor to add more definition. I've been nervous about no-line coloring for fear that the image would just blend together into a blob. This would be a way to save that from happening! I may actually try no-line now! Thank you so much!! Great cards! I esp love the first with the two tone stamping. The colors you chose put so much light and energy into the images. I just love it !! !! What lovely flowers. Thanks for your many beauties. I like the first card best with the green baker's twine. Very cute! Your first card is stunning, Christine. Its very very pretty. Such beautiful colors too. It is really amazing what you can do with the Misti. Love mine and would love to win a gift certificate to Power Poppy. Love the multiple ink stamping! Beautiful! Beautiful cards. Thanks for showing us 2 more ways to use the Misti. I'll have to try these. WOW those cards are gorgeous and stunning. Thank you for sharing them! These cards are soooo pretty, thanks for sharing and joining the hop! Amazing card, Christine! I love the coloring technique. I really want to try this! Thanks so much for sharing with us and for participating in this great hop and giveaway.